You know the kind of feeling when you wake up on some days and just totally feel like ditching your responsibilities? For me, that means housewife responsibilities. Well, yesterday was one of them. I imagined there to be a four-headed monster in the kitchen and gave myself a good reason not to step inside and cook. Thanks to a kind and understanding hubby, we had takeaways for lunch. A delicious pork schnitzel, a piece of slightly overcooked steak, plus a kid's sized pizza named Super Mario which turned out to be even bigger than my biggest frying pan. We seldom eat pizza so this was a rare treat for Angel. When the hubby opened up the box, he asked her "Look, what's this?" Without any hesitation, she replied "ROTI PRATA!" which made us both roll with laughter. If you don't know what roti prata is, it's a very famous Indian dish in Singapore, a kind of flour-based pancake cooked over a flat grill. Finger licking good and makes me crave for it so much now. Do we have it here in Sweden? Well yes, actually, But only comes in plain, non-flavoured and FROZEN. Not really that appetizing if you think about it, so I'm surprised Angel actually picked up the word since we only ate it a couple of times. I'm half wishing, and half dreaming, we could drive out now at 2am to a 24hour food centre and gobble down a few pratas, finishing off with a Milo dinosaur. Well, that's the end of a not really wordless Wednesday post. Talk about food cravings. 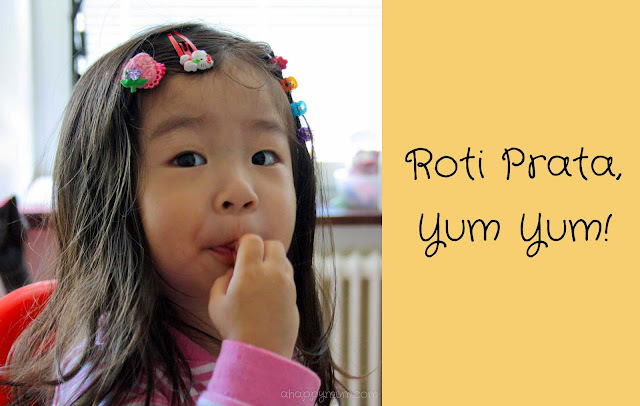 Hope you loved your Roti Prata, my girl! Hi Tahlia, my girl only fell in love with them recently, so maybe yours will do soon some day? Sure hope so! Cute, isn't it? That's the exact sentiments I have whenever I am out of Singapore for a while, when I was in Australia for that couple of years, I always tend to crave for these late night snacks. Hi Rach, yeah imagine being away for 4 years. *gasp* we really miss the food, though it can get a little oily and unhealthy. Hehe. It's still super wuper yummy!